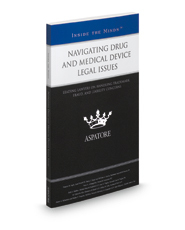 Navigating Drug and Medical Device Legal Issues provides an authoritative, insider's perspective on assisting clients in dealing with legal concerns relating to the medical and pharmaceutical industry, including developing and trademarking brand names, complying with FDA regulations, and preventing or addressing claims of fraud. Featuring top partners from across the country, this book discusses the latest trends in the practice area, including the impact of the Affordable Care Act and recent Supreme Court decisions, such as Mississippi ex rel. Hood v. AU Optronics Corp.
From quality standards to off-label uses, these experts consider the regulations governing drugs and medical supplies and the degree to which they are being enforced. Additionally, these leaders discuss how the unique nature of software is handled in the area of medical law. The different niches represented and the breadth of perspectives presented enable readers to get inside some of the great legal minds of today, as these experienced lawyers offer up their thoughts around the keys to success within this ever-changing field.